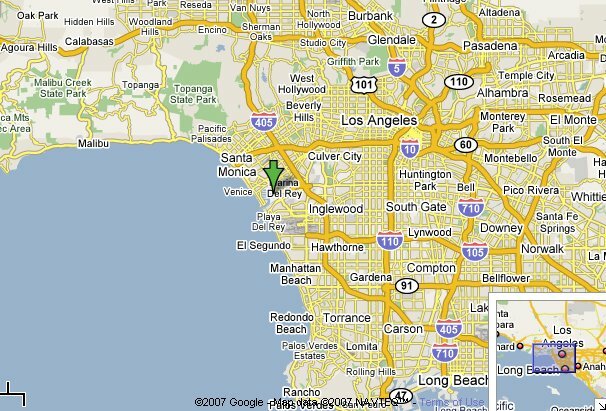 From the North, drive south on San Diego Freeway (405S), past the junction with Santa Monica Freeway (10). Exit at Marina Freeway (90) West and continue approximately 2.5 miles. As the freeway ends, turn left onto Mindanao Way. Continue on Mindanao Way for approximately 1.5 miles to Burton W. Chace Park. From the South, drive north on San Diego Freeway (405-N), past Los Angeles International Airport. Exit at Marina Freeway (90) West and continue approximately 2.5 miles. Before the freeway ends, turn left onto Mindanao Way. Continue on Mindanao Way for approximately 1.5 miles to Chace Park. From the East, drive west on Santa Monica Freeway (10-W) to San Diego Freeway South (405-S). Exit at MarinaFreeway (90) West and continue approximately 2.5 miles. Before the freeway ends, turn left onto Mindanao Way. Continue on Mindanao Way for approximately 1.5 miles to Chace Park. There is parking in Public Parking Lot # 4 (combined with Lot 2), at 13500 Mindanao Way, Marina del Rey which is one block from Chace Park, with a combined total of 370 spaces and a cost of $0.25 per 10 minutes, maximum $8 on weekdays and $10 on weekends. There is also Public Parking Lot #5 at 4545 Admiralty Way, Marina del Rey which is three blocks from Chace Park and located at the corner of Bali Way and Admiralty with a total of 219 spaces for a cost of $0.25 per 10 minutes, maximum $7, and also Dock 52, 13501 Fiji Way, Marina del Rey which is located west on Fiji Way between Admiralty Way and Fishermans Village with a total of 232 spaces which is free. 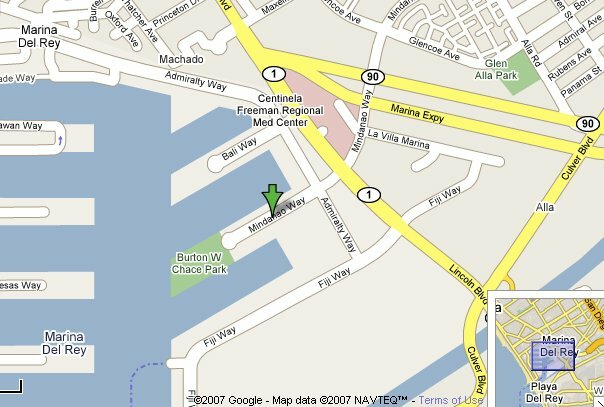 Fishermans Village, Public Parking Lot 1, 13737 Fiji Way, Marina del Rey is located in front of Fishermans Village with a total of 423 spaces and the parking cost is $1 per 20 minutes, maximum $15, but there is some validation with purchases there. Limited disabled parking is available in all public lots. Concert parking is not allowed in Waterside at Marina del Rey Center. Other transportation around Marina del Rey includes the Summer WaterBus which operates to and from the concert site at Burton W. Chace Park. The cost per person is $1.00 each way from stops including Fishermans Village, Chace Park, Ritz-Carlton Hotel, Marina Harbor on Tahiti Way and Dolphin Marina on Panay Way, and Mothers Beach. The Summer WaterBus is operated through LA County Dept of Beaches & Harbors. The Playa Vista residential community offers free shuttle service to and from Marina del Rey concerts, and for more information, please contact Playa Vista. Marina del Rey Summer Concerts are presented by Arrowhead Mountain Spring Water, and Sponsors include Don Knabe, Los Angeles County Supervisor, Los Angeles County Department of Beaches and Harbors, The Ritz-Carlton, Marina del Rey and KUSC-FM.